She who enjoys pizza, enjoys life. When we lived in Italy, we acquired not only a taste for gelato but also for pizza. I’m lactose intolerant and don’t digest gluten well. So if I’m going to eat Pizza, it had better be the best darn pizza that can be found. Unless I am really hungry and low-blood-sugared, I don’t eat pizza. I had better love it so much that the pain of the tummy is eclipsed by gastronomic delights, the ecstatic joys, and the bliss of singing angels. Like with Gelato, when we lived in Eataly, we searched far and wide for the best pizzas to be had. Like other expatriates, after moving to Italy, we gradually developed a discerning taste for sublime pizza. One pizzeria we oft-frequented was chez Pascal the “Pizza Man”. He was an award-winning pizza purist who scoffed at pizza pagans bound for Dante’s inferno. The greatest crime, in his eyes were those who “disrespected” the pizza, by putting ham and pineapples, or artichokes (?) on that hallowed rounded lovingly twirled bed of dough. No, signori, la pizza should only have the following: fresh buffalo or cow mozzarella, tomatoes (preferably home grown), fresh basil, salt, extra virgin olive oil, a powdering of parmiggiano, wild oregano. Pascal only served about 9 different types of pizza using the same dozen ingredients in various combinations. All were vegetarian except for one that had some anchovies. Differences were subtle but divine. For example one had fresh cherry tomatoes added after cooking. Otherwise it was identical in ingredients to the basic Margherita (Named after the queen who favoured the green (basil), white (mozzarella) and Red (tomatoes). Growing up in Canada, we Stephens’ would order pizzas of different sorts and all eat some of everything. When I moved to Italy with my husband and daugther, we initially ordered whatever – and always liked it. But as time passed, I only actually ended up wanting and craving (joy and pain – mamma mia) and zoned in on the Margherita with Buffalo mozzarella. So did my young daughter. I gave her 2 blind taste tests before I had to concede that she could tell the difference between cow fresh Fior di Latte and Buffalo. (I had to be sure since there was always a supplement for the Buffalo). I became so particolare about this particular pizza that I started to wonder about the Italians. Did the Italians have a favourite type of pizza like me? Or did they just order whatever and share? Once this occurred to me, I spent hours asking this to Italians (waiting for pizzas), who were very good-natured about this curious Canadian-Indian lady (who they thought was Portuguese – and a little nuts to boot). Every one I asked told me that they ate 1 type of pizza. And by cielo, were they specific. One lady said, “I only eat the pizza ten minutes after it comes from the oven. I like the cheese to be settled. But 10 minutes maxiumum”. One man said, “I like cherry tomatoes but they have to be added just after the pizza is removed from the oven. Not before. Not during. After. Capisci?” Another fellow said the opposite. Yet another man worshipped at the altar of “Funghi (mushroom) but only the Porcini variety. When the Porcini was fresh, not dried, and in season. In season in Tuscany, of course, not Romania. And of course, it was only made by 1 particular pizzaiuolo (pizza man) in one town, in one restaurant. Of course, open only in the evenings between Wednesday to Saturday. I know what you’re thinking. You think that I exaggerate. I donta exaggerat -ah. 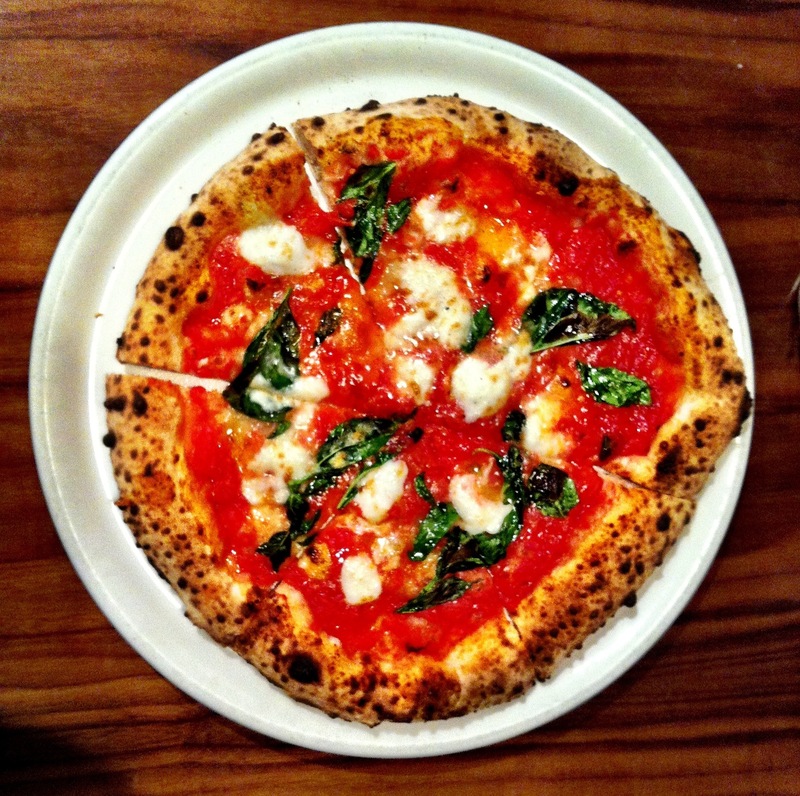 With this background, I would like to share with you a few places that I’ve found in Victoria and Vancouver that cater to my flaming passion and love for pizza (Margherita with Buffalo). A handful of places have the know-how and the magic. I just experienced ecstasy of Prima Strada pizza http://www.pizzeriaprimastrada.com/ in Victoria. Some of their tomatoes come from Saanich Organics (Victoria organic Box Delivery post). The owner Geoffrey isn’t Italian, but like James of Bella Gelateria he gets it – and excels. This entry was posted in Food heros, Pizza and tagged Bibo, Buffalo mozzarella, fiore di latte, Florence, Italy, June 2 2013, Margherita, Mozzarella, Olive oil, Pizza, Pizza Man, pizza purist, Prima Strada, Saanich organic, tomatoes, Vancouver, Victoria, Wine and Food Tasting Event, Wine and Food Tasting Menu on June 1, 2013 by Gurdeep Stephens.